You know those mornings where you roll over, look at the alarm clock and you can’t quite seem to remember what day it is and what you have to do next? Well Sunday morning was that kind of morning for me. I had gone into the bedroom to lie down early after a day of racing on Saturday not really intending on falling asleep, but just to get off my legs and rest a bit before bedtime. The next thing I knew I woke up, rolled onto my side and saw the alarm clock – 3:58 a.m.
As I blinked away almost 7 hours of sleep I reached over to check my alarm which was set at 4:00 a.m.
Then it hit me – you’ve got another race today, better get moving. I rolled out of bed, shut off the alarm before it sounded and gingerly walked to the bathroom. I had the usual post-race tightness in the hamstrings and calves, but all things considered I felt pretty decent. I brushed the teeth, started to wake up a bit and hopped into a hot shower to loosen up the muscles and started to think about what lay ahead. 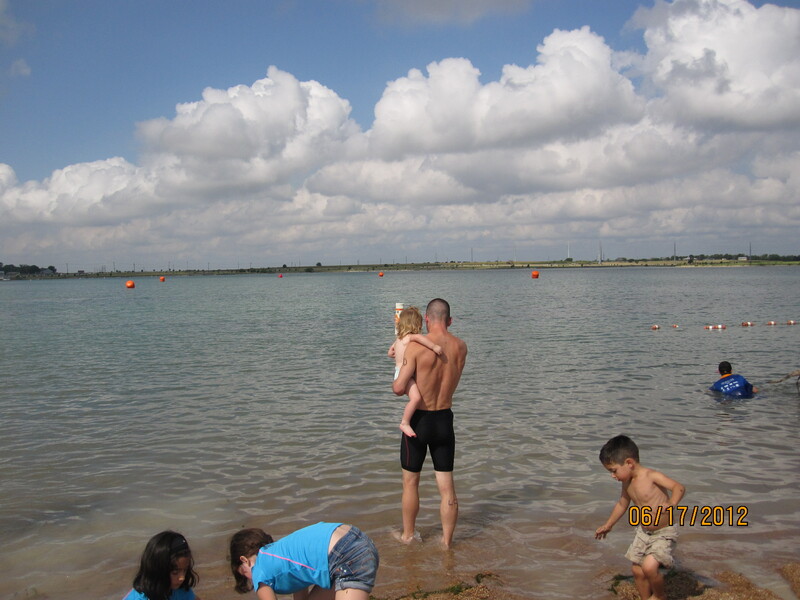 500 Meter Swim, 14 Mile Bike, 3 Mile Run – Lake Pflugerville Triathlon. 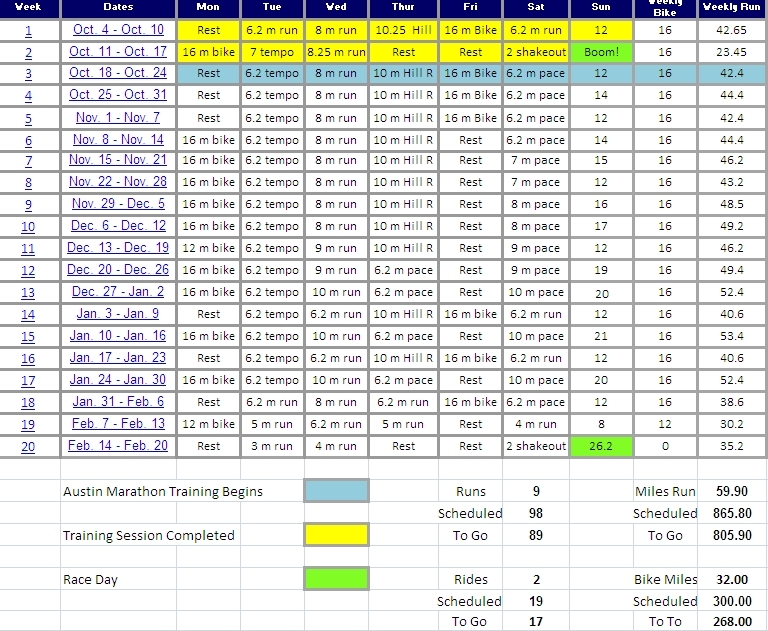 This would be our first year racing “Lake P” as it is known around Austin in the Endurance Athlete Community. A friendly, smallish Triathlon that caps registration – this year at 800 entrants. The Transition Area is “Open”, meaning that you can rack your bike anywhere that you like, you do not have to rack within your age group – so I decided to head over a little earlier than I had originally planned to get a good spot. I had packed everything the night before, the only things left to do were to retrieve my frozen water bottle for the bike out of the freezer, load up my cooler with a couple of Gatorades and waters, put my transition bag in the truck and load the bike in the back. I grabbed my run watch out of the charger and I was out the door in less than 5 minutes. I made the 25 minute drive over to Lake Pflugerville and entered the parking lot about 5:10 a.m. I was one of the earlier athletes to arrive, so finding a good spot to rack and set up transition was not going to be a problem. I made my way over with my bike and bag to Body Marking and ran into my friend Jay Tedder. He was a couple of athletes ahead of me and we decided we would rack our bikes in the same space. I got my race number 430 written down both arms, across both of my quads just above the knee and my age group written on my right calf “45”. The Holland 5K on Saturday was my final race as a 44-year-old. From here on out I would be competing with the 45-49 year olds for the next half-decade. It was an odd thought to have so early in the morning, but I was a little sad about leaving my last age group. It was definitely a tough, challenging group of competitors in Austin. Now I was the “young guy” again, looking to establish myself in a new sport, with a new group of athletes. I racked my bike next to Jay in a good spot, just 7 racks from the Swim Entrance, about half-way up on the left-hand side. I would be able to grab my bike and head right out of transition to the mounting line very easily. Then repeat the process coming in from the bike course, re-rack my bike and hit the Run Exit within 400 meters. Perfect. I laid out my transition mat, placed my run shoes down with my quick tie laces at the read, my run watch, wrist band and my race belt that held my number 430 bib in place. Next it was my bike shoes opened up as far as they could go. I rolled up my socks, ready to be put on wet feet on top of my bike shoes and placed a small towel and squeeze bottle of water next to them to clean my feet coming out of the swim area. I placed my helmet on my aero bars, straps open and my riding glasses inside ready to be placed on when I approached the bike. I clicked in my Garmin bike computer. Put in my frozen water bottle filled with Gatorade in between my bars so it would thaw out and checked my tire pressure. I grabbed my goggles and silver swim cap, hit the porta-potty for the last time and got ready for the swim start. I ran into my friends Erin and Dan who were at the Holland, TX 5K on Saturday – Erin was the 2nd place female overall, crazy fast runner – Ed and Jay who I was racked right in between. At first we were all laughing and joking around, but as the first swim waves took off it started to get a little more serious. I spoke with Jay a bit when Ed left to go off with the 30-34 age group. In 6 minutes I would be wading out into the water. As they called our wave I slid into the water, fixed my goggles and went under to get wet and acclimate to the water temperature. The lake felt just a little bit chilly, which meant that after 50 meters, it would be perfect. Wind was calm, the water was pretty smooth, but my wave had 50 athletes competing. It was going to be crowded. I decided to stick to the outside of the course so that I would have limited bumping and fighting going on as swimmers tried to cut close to the buoys. This was going to make the distance that I needed to swim longer, but I was willing to trade that for cleaner water. There was also some hydrilla and seaweed type greenery that we were going to have to battle through heading away from the shoreline and on the way back in. Perfect I thought – just what I needed, a little more difficulty added to my weakest event. At the horn we were off and I fell into a comfortable pace right away. I did not feel like I was really “swimming fast” but I was relaxed and seemed to be holding my pace with the swimmers around me. I was sighting ahead and staying to the right of the crowd, with just a couple of swimmers bumping into me over the first 100 meters. We reached the second buoy and the course made a slight left to the midpoint as the course was set up like the roof of a house. Straight up the side for 200 meters, 50 meters slightly left to the highpoint or “roof”, then a tight left turn to head back the other direction for 50 meters followed by another slight left turn and then 200 meters for home. At the Red Buoy, or the high point of the course I got caught with two other swimmers, one on each side of me. A couple of bumps on the arms and one shot to the leg by a kick. I decided to swim around to the outside of the athlete on my right and I got out of the wash. It cost me some time however. I hit the last 100 meters and encountered the green stuff from the bottom of the lake. It was catching in my fingers and hands as I entered the water, shortening my glide, catch and pull. I tried to keep it out of my head, stay relaxed, keep breathing and swim to the finish. I hit the flats, got vertical and pulled off my cap and goggles – I knew my swim as not “fast”, but I had made it – time to get moving. We had some people to catch. I ran up out of transition, grabbed a cup of water, and navigated the left turn to the stairs. Ran down carefully to make sure I didn’t slip and fall and then ran into the bike area. I wiped my feet, pulled on my socks and then both bike shoes. Glasses on, Bike Helmet on, hit start on my bike computer and pulled down my bike. I ran with my bike shoes up the hill out of the racks, made a right and reached the bike mounting line – I pushed off, threw my leg over the bike and clipped in. Transition Time 1:51 – pretty solid. Like the last two triathlons that I competed in, I hit the bike hard in an effort to make up for our slow swim. I flew through the gears and was at top speed within 30 seconds. The course was “flat”for Austin Standards, just 300 feet of climbing along the course over 14 miles – the hills that were there to tackle were mostly in the second half of the course. I stayed on the front edge of my seat and hammered away. I was hoping to average 21-21.5 mph on the bike which would put us in a pretty solid position heading into the run leg. I was a bit surprised at how strong my legs felt firing away on the pedals after racing on Saturday. Running and Cycling uses very similar muscle groups – but they are not identical exercises by any means. I had a feeling that I was going to feel the effects of Saturday’s race when I started the run leg. But for now, it was time to make our move. I stayed on the large ring and hammered away at the course. At each beep of my computer marking 1-mile I would glance down at my total time for that mile and take a drink out of my water bottle in front of me. As long as I stayed below 3:00 min./mile I was averaging over 20 mph. My first 7 miles on the bike clocked at: 2:17, 2:48, 2:30, 2:46, 2:57, 2:46, and 2:58. We made it around a curve to the right and climbed up one of the longer hills to start the second half of the course: 2:48, 2:49, 2:34, 2:34, 2:49, 2:39 were the next 6 miles. A sharp right off of the frontage road of the toll way and we climbed back into what little wind was on the course for the final mile. 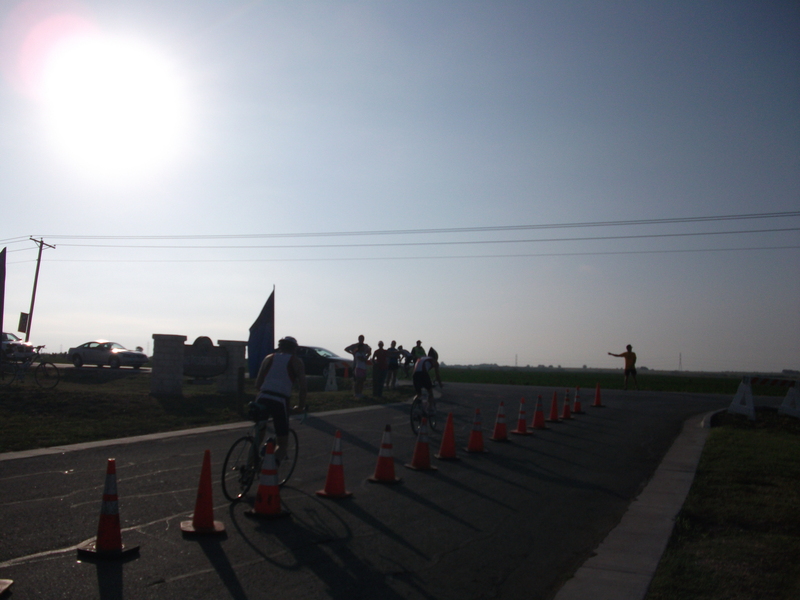 Then back up into the transition area and the dismount line – final mile 2:58. Bike Time: 38:19 – 21.9 mph. I ran the best I could in my bike shoes back into the transition area and found my spot to re-rack the bike. I flipped the bike around, slid the seat over the bar, took off my glasses and helmet and laid them on top of my transition bag. Took off my bike shoes, clipped my run belt on with my bib number and made sure the number was in the front, put on my wristband and run watch, then slid into my race shoes. I hit the water bottle for one last sip of Gatorade and ran out of transition. Transition time: 1:20. :10 short of outstanding. I glanced down at my watch and the time was frozen on 4:54 a.m. My Garmin has been on its last legs for a couple of months, but I had been able to do a hard-reset of it to bring it back to life on a few occasions. As I ran out of transition I tried to revive it – but it simply had given up the ghost. I was going to have to run by feel for the next 3 miles. No idea if we were running fast or slow as it is very difficult to gauge speed accurately coming off of the bike. No matter. I decided to run even at the hardest pace I could hold for 3 miles. Over the last 400 meters or so I would kick to the finish with whatever we had left. I had remembered that the Triathlon packet said that there would be water stops at the 1 mile and 2 mile portions of the run. That would help me break up the run leg and just focus on the mile I was running. I hung to the left of the course and gobbled up the athletes in front of me. I was seeking out members of my age group with a number between 45 and 49 on their right calf, but I was running into runners from the earlier waves, 35-39 and 40-44 more than anyone in my group. That was not necessarily a bad thing as I was gaining ground on athletes who had started 3 and 6 minutes ahead of me, but I was not able to find anyone to lock on to and “race”. I hit the first aid station, grabbed a cup of water and poured it over my head as I went by. The cold water felt good going down the back of my neck as the temperature was in the mid 80’s and the sun had broken through the overcast clouds. When I reached the second aid station I heard a “Go Joe!” from my friend Ed as I went by – but I couldn’t do much more than raise an arm in acknowledgement and keep on pushing. My legs were now starting to fight back in a big way after Saturday’s race. On a day where I would have typically ran 8 easy miles at a pace almost 2 full minutes slower after a 5K race – I was right back hammering away as hard as I could. We reached what I estimated would be the final ½ mile and I started to lengthen my stride a bit more on every step. Perhaps dropping pace another :10 a mile, I felt like I had a little bit left before the kick. When we reached the final straightaway and I could see the finish line chute in the distance I went into my kick. 2/10 of a mile, perhaps a little bit more – I emptied the tanks. Run Time: 18:41 – 6:14 pace. We finished 51st overall, 49th among the men, 6th in our Age Group. Our run time was fastest among the 45-49 year olds, 6th fastest overall in the triathlon. Not too shabby after racing the day before. We did not make it onto the podium on Sunday, finishing about 2 minutes out of the money, but that was o.k. as we know exactly where we need to improve. We need to swim much more aggressively, practice harder and we are going to have to be willing to “mix it up” a bit in a crowd to shorten the course. If I am going to compete in the triathlon the same way I do in running races, I am going to have to do so in the same fashion. At a run only event I line up with the top area runners, I go toe to toe with them and trade licks. I don’t back down, run for cover or hide out there on the race course. I just thunder away and do the best that I can mile after mile. I need to stop thinking about my triathlon “starting” with the bike leg. I need to swim faster. 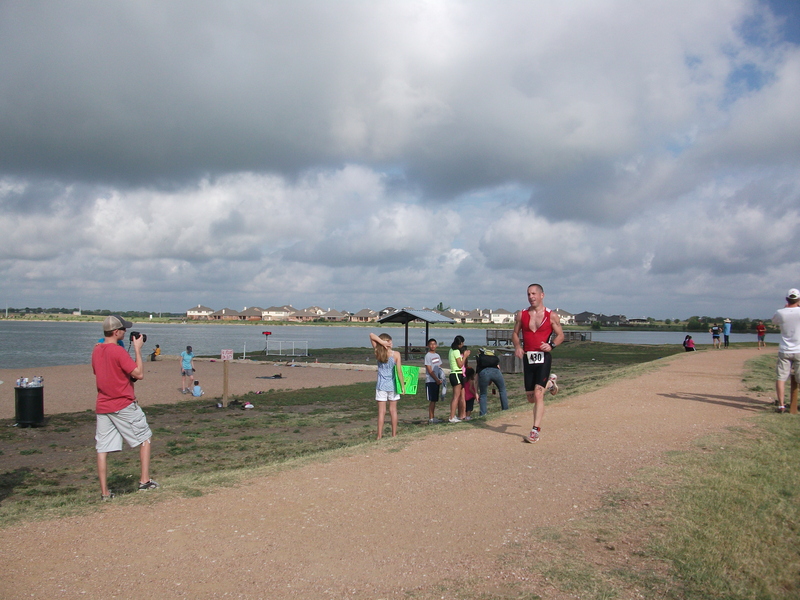 It was a great day of racing and a great event at Lake Pflugerville. Post-race Pizza, Ice Cream, Popsicles for the kids (and adults), Shiner Beer, Cold Water, Frozen Towels – all great stuff. Ironic that my 21 month old wanted to go hop in that lake where an hour and a half earlier her Father had gone so grudgingly. Once again, lessons are everywhere if you just pay attention. Landry & Daddy heading to the lake. Thanks Landry for reminding me the value of being fearless and in the fact that 90% of success is simply in showing up. 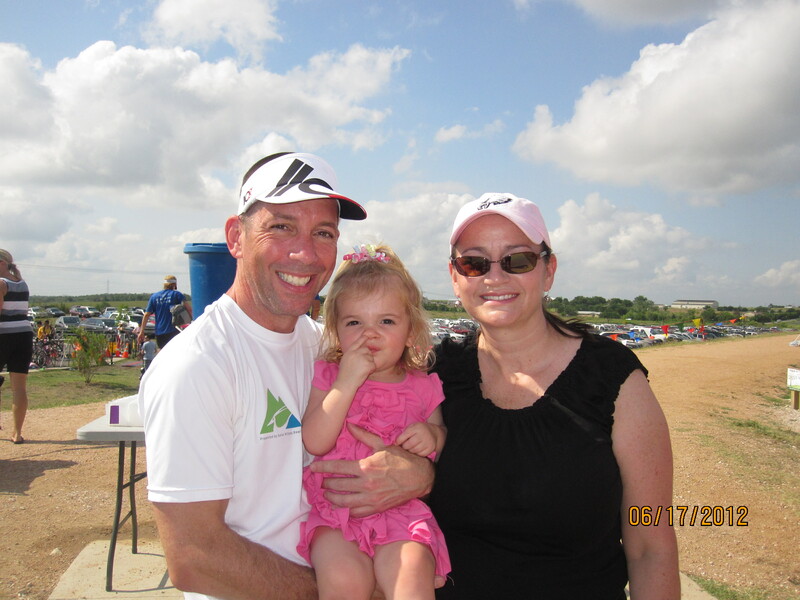 Dad is going to remember that next month at the Couples Triathlon at Decker Lake – and he is going to bring it. Any way you slice it – it was a pretty darn good weekend of racing. Hi Joe – first, thank you for your nice comments! It was a pleasure to race with you both days (up for it again next year?) and you deserve major kudos for super strong performances on both days. I knew you would knock it out of the park on your run – no surprise there – but what really impresses me is your bike speed. You’ve got talent dude! Keep on doing what your doing! Thanks Erin! I think this is going to be a 3rd weekend in June tradition! I’m going to really focus on the swim in the “off-season” as part of my marathon training and go into full “beast-mode” next TRI season! 58 Mile Ride to Andice, TX and Back.